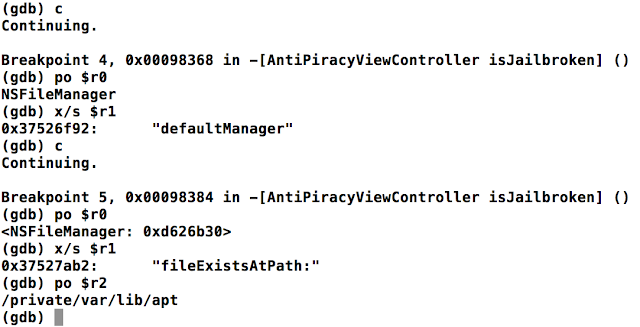 I've been teaching iOS Application Security and Auditing to pentesters and developers (secure programming guidelines) online / real world and one of the questions which always comes up is can Anti-Piracy measures work if implemented in the application? Pentesters want to know if they could run into problems with applications implementing runtime protections. Developers on the other hand, want to know if they can sleep well if they implement such protections. The short answer is NO, if your code runs on a platform controlled by the attacker, and if he is skilled enough, he would eventually figure out how to subvert your protection. This is especially true for a Jailbroken device where the attacker can pretty much run anything. I can already see pentesters smiling :) If you know how to do runtime analysis using Cycript and GDB, then you should be able to subvert most protections. However, as this is significantly different from other application pentests (web and network) and involves a component of reverse engineering an application on the ARM platform, this might get interesting and challenging! This blog post is the first in the series I am planning to talk about the common techniques used by developers today to check for jailbreaking and how an attacker could subvert them. In order to try things out and we need a sample application! :) I've created a simple AntiPiracyDemo Application for iOS which I use for my online iOS course. You can download the IPA here. Please note that this is a self-signed application and would require a Jailbroken device (iPhone / iPad) to run. Clicking on the button, confirms this application is running on a Jailbroken phone. The developer of a real world application can now exit or send a report (privacy violation? :) ) back to his server to notify. 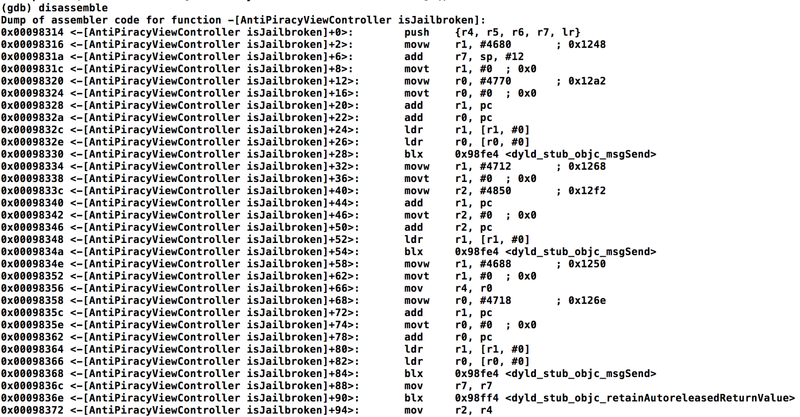 Step 7: We see a "checkPiracy" method and more interestingly - we see a method called "isJailbroken" which returns a BOOL and takes no inputs which probably means this checks for a jailbroken state. 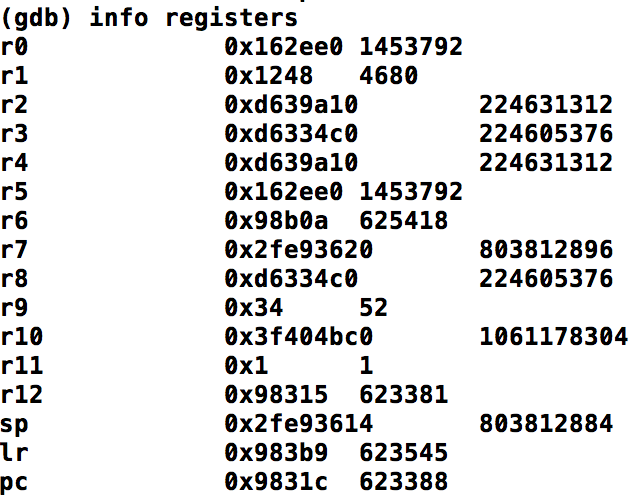 Step 5: iOS devices have an ARM based processor and what you are seeing is ARM Assembly. 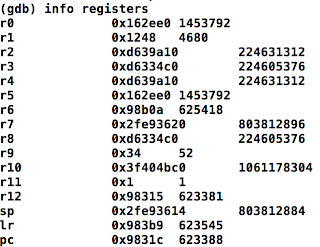 If you are from the x86 world then there is only one thing you need to keep in mind when working with ARM assembly - the arguments are passed via the registers R0, R1, R2, R3. More than 4 arguments are passed on the stack. Here is the ABI document if you are interested. NSSString alloc is not interesting, Let's repeat the same for other breakpoints. 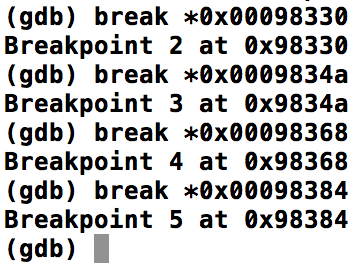 Below is the output when we hit Breakpoints 4 and 5. Breakpoint 4 tells us that the application is using NSFileManager and Breakpoint 5 tells us it is checking for "FileExistsAtPath:" for "/private/var/lib/apt" Very interesting! APT is probably is one of the first binaries to be installed on a Jailbroken phone to manage packages from Cydia. Looks like the developer is checking for the presence of this binary. Step 9: So where do we go from here? The return value is stored in R0 and if you check the documentation of NSFileManager FileExistsAtPath it returns a BOOL. This means "0" will be returned in case the device is NOT Jailbroken and "1" will be returned if it IS Jailbroken. Step 11: If we check the Application now - it happily tells us that "This iPhone is NOT Jailbroken"
Of course, we have not patched the check in the binary so you would need do this every time :) I will take up Application Patching in another blog post. The above command should give you a ton of output! 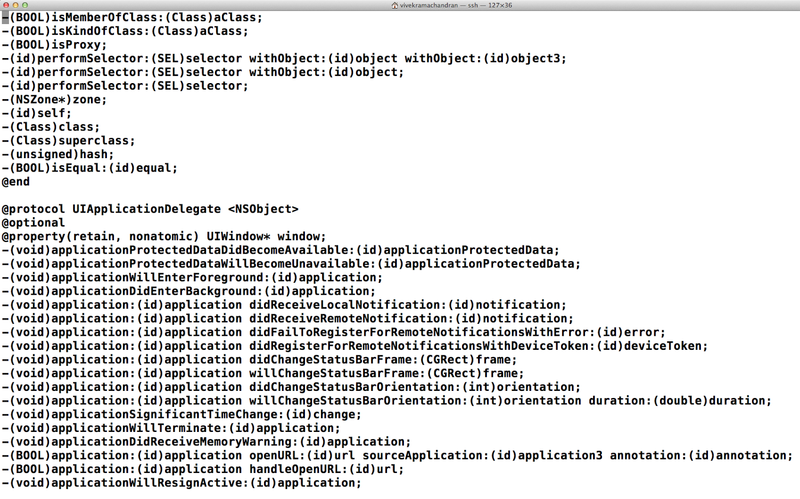 You can clearly see isJailbroken is there in it as highlighted. What is really isa.messages? If you look at the Objective-C runtime implementation, then isa is really a pointer to the class structure itself. If you’re a procedural programmer new to object-oriented concepts, it might help at first to think of an object as essentially a structure with functions associated with it. This notion is not too far off the reality, particularly in terms of runtime implementation. Every Objective-C object hides a data structure whose first member—or instance variable—is the isa pointer. (Most remaining members are defined by the object’s class and superclasses.) The isa pointer, as the name suggests, points to the object’s class, which is an object in its own right (see Figure 2-1) and is compiled from the class definition. The class object maintains a dispatch table consisting essentially of pointers to the methods it implements; it also holds a pointer to its superclass, which has its own dispatch table and superclass pointer. Through this chain of references, an object has access to the method implementations of its class and all its superclasses (as well as all inherited public and protected instance variables). The isa pointer is critical to the message-dispatch mechanism and to the dynamism of Cocoa objects. Hope you enjoyed this post. I will creating more posts on Bypassing more checks like Binary checks, Bundle and Hash checks etc. in coming posts. Stay tuned! If you are interested in learning how to methodically understand many of the above concepts and test iOS applications with a blackbox approach, then please have a look at my SecurityTube iOS Security Expert (SISE) is an online course and certification which focuses on the iOS platform and application security. This course is ideal for pentesters, researchers and the casual iOS enthusiast who would like to dive deep and understand how to analyze and systematically audit applications on this platform using a variety of bleeding edge tools and techniques. Is there any video tutorials please? I can't get the AntiPiracyDemo App to install following your instructions. I also tried using iFunBox. Any ideas?